On the surface, everything seemed to be calm in RN Palayam in Tamil Nadu’s Vellore district on Tuesday afternoon, shortly before President Ram Nath Kovind accepted the Election Commission’s recommendation that the April 18 elections in the constituency be cancelled over allegations that voters were being bribed. On April 1, Income Tax officials said that they had seized Rs 11.48 crore cash from a cement godown belonging to Dravida Munnetra Kazhagam Treasurer Durai Murugan. It didn’t take more than casual conversations, though, residents of the working-class neighbourhood with predominantly Muslim population, to express their anger and disappointment with the commission’s decision. 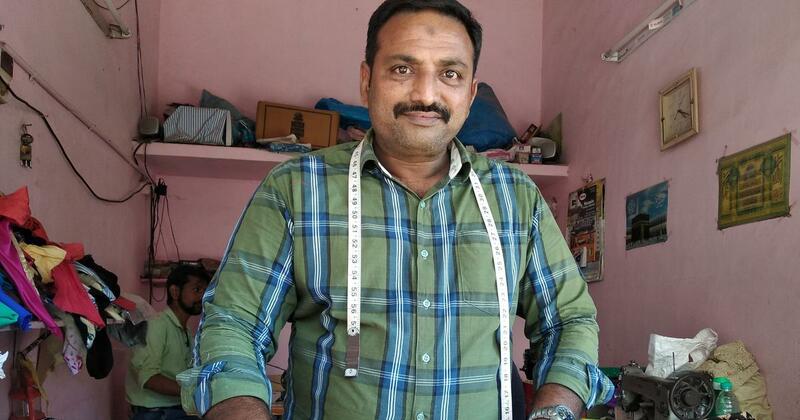 Frustrated by factory closures, the cumbersome rollout of the Goods and Services tax regime and rising prices, many in the RN Palayam say they were eager for the opportunity to send a signal to the state’s ruling All India Anna Dravida Munnetra Kazhagam. Even as the election to the Lok Sabha have been cancelled in Vellore, bye-elections will be held as scheduled to the state assembly seats of Ambur and Gudiyattam, which are part of this parliamentary constituency. The decision to countermand the election was made on the basis of a report filed by the Chief Electoral Officer on April 12, in which the raids had yielded Rs 11.48 crore in cash along with computer printouts detailing how the money would be distributed across assembly segments, wards and booths. This suggested a clear-cut design to influence electors at a large scale across the Vellore parliamentary constituency, he said. The vitiated environment was not conducive for conducting an inducement-free, ethical election in the Vellore Parliamentary Constituency at this juncture, he said. This is the first time elections to a Lok Sabha seat have been countermanded because of voters being bribed, The Indian Express reported. On Tuesday, Shaik Azam took a break from cutting cloth in his tailoring shop to explain the situation in the area. “In this constituency, the voters are waiting for a change,” he said. 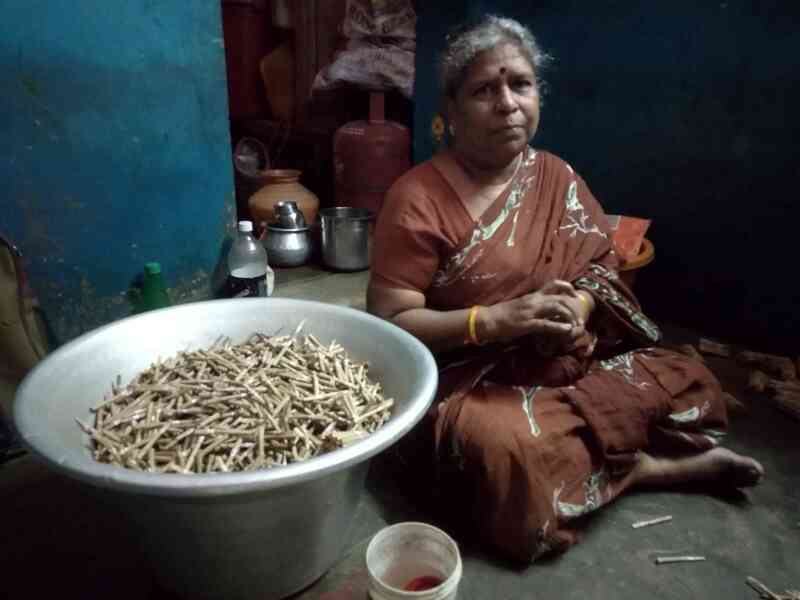 A large part of the population in RN Palayam, and the neighbouring Kaspa, a Dalit locality, worked in shoe factories and beedi packaging units. 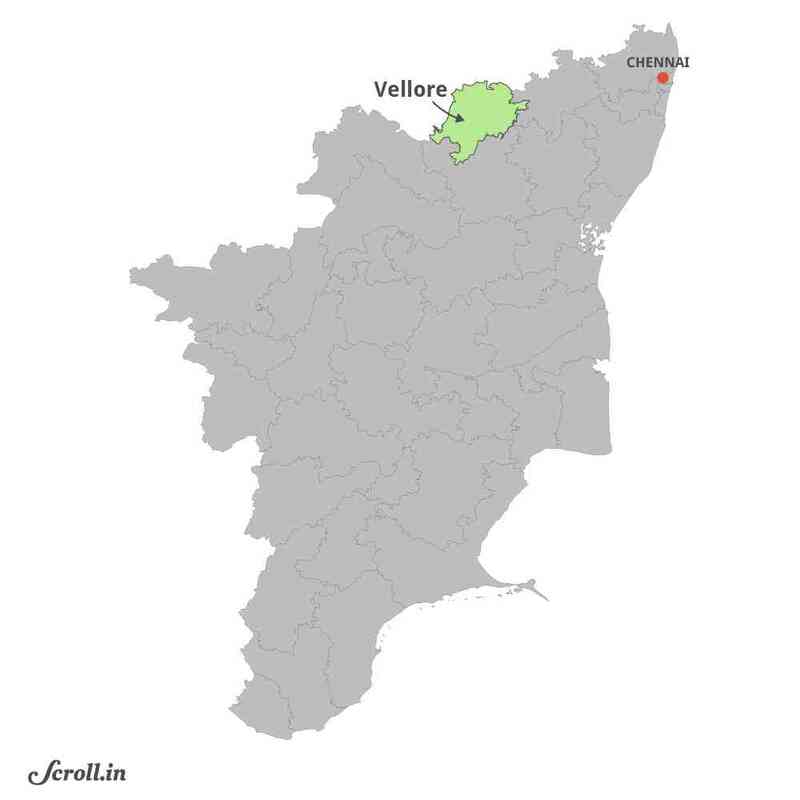 In Vellore, 24.28% of the population is Muslim, members of the Schedule Castes are 18.9% while members of the Schedule Tribes form 2.3%. However, many lives have become precarious of the past five years, some as a direct consequence of the ruling Bharatiya Janata Party, which is contesting the Tamil Nadu elections in an alliance with the AIADMK. Four shoe factories near RN Palayam were closed, leaving nearly 15,000 people jobless. The decline in the availability of leather is a consequence of the BJP’s decision in 2017 to ban the sale and purchase of cattle from animal markets for slaughter by notifying a stringent rule under Prevention of Cruelty to Animals Act. Madhavi lives with her daughter and two granddaughters. 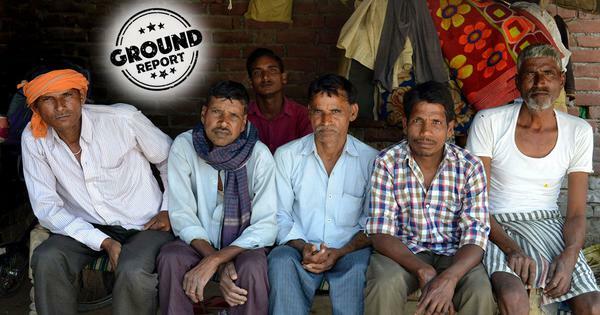 Only her daughter has a regular income: she earns Rs 7,000 per month working in the shoe factory. Though Madhavi identified the candidates contesting from the DMK and the AIADMK by name, she said none of candidates had visited her home. Janani spent her childhood in Chennai but she and her family returned to their native town in 2015 when she was in Class XII after the devastating floods that year completely destroyed their home. Her father opened a cycle shop in Vellore to support his family. Having studied in government school and college, Janani felt that the Central government was unfair in making prospective doctors even in the states take the National Eligibility and Entrance Test, which is required to gain admission to medical college. Students from state boards have resisted the national NEET exam conducted by the Central Board of Secondary Education, claiming that it is based on the central board’s syllabus, which is vastly different from the ones they follow. But not everyone criticised the decision to rescind the polls. A short distance from Kaspa and RN Palayam, in Katpadi, the home town of DMK candidate Kadir Ananth, some welcome the Election Commission’s decision. Ananth is the son of Durai Murugan, in whose godown the cash had been seized. “We are happy that the Election Commission has rightly cancelled the Vellore Parliamentary Constituency Election,” said I Elangovan, a staffer at Thiruvalluvar University who is registered to vote in Katpadi.